Wednesday night’s matchup at The Q is a battle between two teams looking to build some momentum going into the Break. The Nets can keep their turnaround season rolling by going into All-Star Weekend above .500 for the first time in six years. The Cavaliers, who are finally starting to get healthy, can go 4-4 over their last eight games before the mid-season classic with a victory tonight. The Wine & Gold took care of the lowly Knicks on Monday night – going wire-to-wire with six players scoring double-digits, including Kevin Love – who scored 12 of his 14 points in the first quarter of the win. The surprising Nets – still locked into the sixth Playoff spot in the East despite struggling in February – come into tonight’s contest have dropped two straight – including a heartbreaker two nights ago in Toronto, with Kawhi Leonard banking home the game-winner with 4.4 to play. These two squads have split their season series so far – with the Nets dropping Cleveland by 16 at The Q in the first week of the season and the Wine & Gold getting the victory in Brooklyn back on December 3 when then-Cavalier Alec Burks dunked home the game-winner in the closing seconds. After setting the franchise back years with a terrible trade in 2013, the Nets are finally seeing light at the end of the tunnel. And they’ve done a lot of it using some castoffs from other teams. No player is a better example of that than former Buckeye, D’Angelo Russell, who was tabbed with the second overall pick out of Ohio State in 2015 but was shipped to Brooklyn after his first two seasons in Tinseltown. He was solid in his first season with the Nets, but has been outstanding this year – improving his numbers almost across the board, leading his squad in scoring and assists and earning his way to the first All-Star bid of his young career. Russell was excellent in his last outing – going for 28 points and 14 assists in the loss against Toronto – and led both squads with 30 points the last time he faced the Wine & Gold. Russell will have his hands full with the Young Bull on Wednesday night. The precocious rookie from Alabama has now reached the 20-point mark in three of his last four games – including a 20-point outing in Monday’s win over New York – and is averaging 22.5 points per, shooting 44 percent from the floor and 44 percent from long-range over that stretch. Let’s be honest, Joey Hoops is easy to root for – even if he’s not on the Wine and Gold anymore. A second round pick by the Cavaliers out of Virginia, Joe Harris went from a back-of-the-bench guy to a viable starter with a Playoff squad in Brooklyn. He comes into tonight’s contest averaging 13.7 points per, shooting .465 from long-range – good for third-best in the NBA and enough to earn him a ticket to Charlotte, where he’ll compete in the Three-Point Shootout this weekend. After David Nwaba got the previous two starts at the 2, one of the two players acquired at the Trade Deadline – Brandon Knight – got his chance in the starting lineup, and for the second straight appearance, he didn’t disappoint. After not playing in nearly a month, Knight – the 8th overall pick of the 2011 Draft drilled all three three-pointers he attempted on Saturday night in Indiana and came back to knock down three of four triples in Monday’s win over New York, finishing with nine points in each contest, adding three boards and a pair of assists. Wednesday’s head-to-head meeting might be an aerial assault between two shooters who can get hot in a hurry. It’s been an odd year at the center spot for the Wine & Gold. 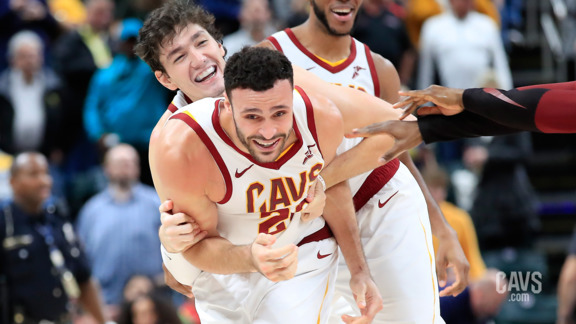 Almost everyone who’s played the position has suffered some type and degree of injury; but everyone who’s played the position – Tristan Thompson, Larry Nance Jr. and Ante Zizic – has played it very well. Nance has been outstanding in any role this season, and he’s playing maybe the best ball of his career heading into the All-Star Break. On Monday night, the Akron native notched his sixth straight double-double – notching 15 points and a game-high 16 boards, going 5-of-6 from the floor, 4-of-4 from the stripe to go with four assists. Over that six-game stretch – half of which he did his work off the bench – Nance is averaging 12.7 points and 13.3 boards, shooting 54 percent from the floor, 50 percent from long-range and 71 percent from the stripe. On Wednesday, he’ll take on Brooklyn’s leading rebounder and a key piece to their future, sophomore big man, Jarrett Allen. The former No. 22 overall pick out of Texas has doubled-up on 17 occasions so far this season, including a 12-point, 10-rebound effort against Chicago over the weekend, but the Wine & Gold have held him in check this season – averaging just 9.5 points and 5.5 boards in two meetings with the Wine & Gold. As the Cavaliers starters continue to get healthy, Cleveland’s second unit – already one of the better collectives in the league – gets even stronger. In Monday night’s win over New York, three reserves tallied double-figures in the win. Jordan Clarkson, natch, led the group with 15 points, going 6-for-17 from the floor to go with six boards and a steal in 28 minutes of work off the bench. Matthew Dellavedova finished with 12 points on Monday – going 5-for-10 from the floor to go with three boards and a team-high six assists. Nik Stauskas made his Cleveland debut on Monday night and canned a three-pointer to go with five rebounds in 22 minutes of work, but he’ll up his production once he gets more comfortable with the squad. Brooklyn’s main weapon off the bench is Allen Crabbe, who returned three games ago from a knee injury and jumped right back in the groove, netting 22 points in Monday’s loss to the Raptors and averaging 20.5 points per over his last two – shooting 60 percent from the floor, including 58 percent from beyond the arc.